If you control a WIND monster, you can Special Summon this card (from your hand). 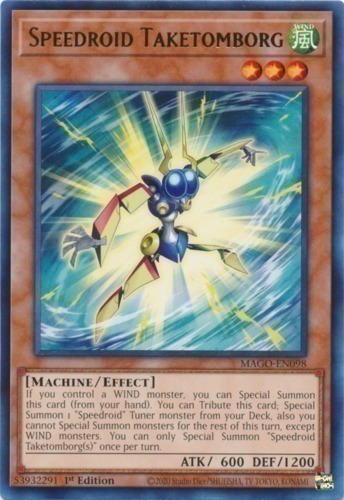 You can Tribute this card; Special Summon 1 "Speedroid" Tuner monster from your Deck, also you cannot Special Summon monsters for the rest of this turn, except WIND monsters. You can only Special Summon "Speedroid Taketomborg(s)" once per turn.